Announcement Traditional artisan metalwork and beaded jewelry, little treasures handmade one-at-a-time with careful attention to detail. Find me also at Petaluna Jewelry Design on Facebook and Instagram! Traditional artisan metalwork and beaded jewelry, little treasures handmade one-at-a-time with careful attention to detail. Find me also at Petaluna Jewelry Design on Facebook and Instagram! Sterling Silver Square Solitaire Ring, stamped design, layered squares, modern, textured pattern, heavier comfort band. Size 6.5. This is the sweetest little leaf necklace. I had the matching earrings already and when I saw the necklace I couldn’t resist. 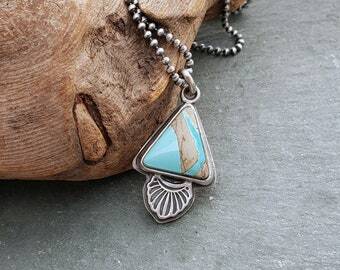 Great as a layering necklace or by itself. Beautifully crafted piece. Fast shipping. Thanks again Diane! What a stunning creation! The stone is gorgeous and the stamping makes it so unique. It's also very comfortable to wear. Thank you for shipping so quickly. I hope to own more of your beautiful work! 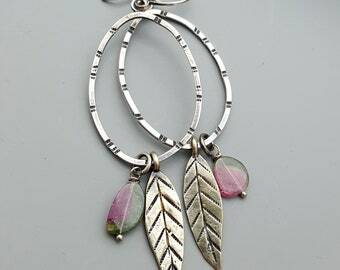 Adorable and fun dangle earrings. A great find and addition to my collection from this artist and shop. Thanks, Diane! The beginning of a big statement ring. Began as earrings! Serendipity. I have a huge hoard of design stamps, but acquired some special new ones recently that have sparked some fun new ideas. Some new sapphires for hire! If my pink sapphire lotus ring currently available isn't your size, or you prefer a different stone or border, we have multiple options. :) Pendants, too! Stacking bangles are fun. Why wear one when you can wear 3? Lots of gorgeous stones to choose from, many possibilities! Spotty montana agate in sterling silver. I’ve always been more focused on the micro-world; textures, tiny precious things, the universe under our feet, and objects from nature and urban life that fit in the palm of the hand for contemplation. I've been making stuff as long as I can remember, and I can't imagine a non-creative life, it always comes out somewhere. I graduated with a Bachelor of Fine Arts from Wayne State University in Detroit and studied drawing, painting, printmaking and sculpture, but ultimately felt pulled toward metalsmithing and jewelry design because I love the intimacy and scale of small, personal and precious objects worn on the body, and the way humans have been decorating themselves across time and cultures. I like to see the mark of the maker in handcrafted jewelry, though I have a leaning toward “refined rustic” because I’m still a bit of a detail freak when it comes to finishes. Inspiration can come from anywhere, but I'm often drawn to Eastern motifs, antique textiles and botanicals, and I like incorporating stones, beads, old and ancient things, and found objects in both delicate and bolder statement jewelry. A recent interest in turquoise, Native American design stamps, and larger stones has taken me in a new direction, as well. Always in evolution, as it should be. I hope you find something here that you love! I enjoy the creative process, and I REALLY love manipulating metal and making jewelry! Thanks for visiting my Etsy store! Please see my profile page for more about me. You can use your credit or debit card through Etsy checkout or any Paypal option you choose. Please note that I'm required to add sales tax for Michigan residents, which will automatically calculate at checkout. 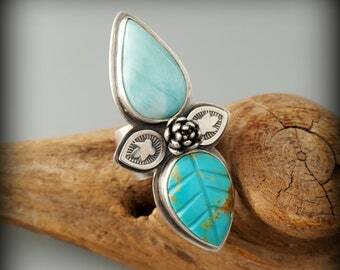 Your jewelry will ship gift boxed by First Class U.S. mail with Delivery Confirmation unless otherwise noted in the item listing. If you wish to upgrade to Priority Mail or Express Mail, please convo for an adjusted invoice, preferably before checking out. All jewelry and packaging comes to you from a smoke-free studio. Please don't wear your jewelry in the shower, swimming, etc. Silver and other metal jewelry, including my pieces with the antique French steel beads, will store best in air-tight containers, away from moisture and humidity. Ziploc bags are not glamorous, but work very well to significantly slow the natural oxidation process. 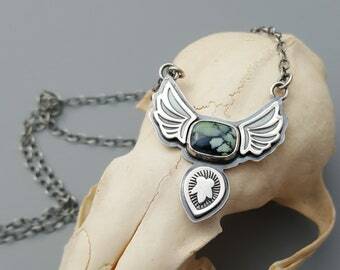 A polishing cloth pre-charged with a fine polishing compound can be used to buff the surface of silver and other metal, but gently on items that have a decorative "antiqued" patina, particularly in the recessed areas, and best to avoid the gemstones. For pieces set with cabochon stones, especially the transparent and semi-transparent variety, I recommend avoiding submerging in any liquid to avoid the possibility of water working its way behind a stone. If you have a damage or breakage issue with your jewelry, please convo. I will do repairs free of charge if your jewelry fails under normal wear (meaning you take reasonably good care of your jewelry and don't abuse it). For damage beyond normal wear (breakage from cute little grabbing baby fists, yanked to bits in a bar fight, left it on the train tracks, etc. ), I will do my best to attempt repair if it's fixable, but depending on the extent of damage and missing parts, there would be fees for part replacement and labor in that case. For the record, I've only had to do one repair, and that was a leather necklace worn 24/7, including in the shower, which I don't recommend. At this time I'm not generally taking custom orders, although small variations on existing designs might be possible, and you can always inquire. Most of my rings with stones cannot be resized, but if you see a design you love, feel free to ask about a replication or a similar ring. Most commercial jewelers have the proper equipment for resizing should you wish to purchase a ring already made to a specific size. Some bands lend themselves better than others to resizing. Custom sized ring orders - it's important we know your size, and I use several industry charts and digital caliper measurement to achieve standard sizes. There may be a bit of play with a quarter size in either direction. For wide (1/2 inch average) bands, I recommend ordering 1/4 to 1/2 size larger from your normal size, possibly more depending on your personal anatomy, since they will feel tighter than thin bands. One thing to take into consideration is whether your fingers tend to swell with seasons or hormonal changes, and your rings may fit differently at different times. If you are at all unsure of your ring size, I recommending having it checked at a local jeweler for both narrow and wide bands. This is much more reliable than printed paper cutouts, but you can also purchase a plastic ring sizer for a small fee from my shop. Finishing a ring to your specific size is considered a non-refundable custom order unless discussed otherwise. I do occasionally wholesale some of my jewelry, though at this time I am not scaled to do it volume. Please convo if you have a brick and mortar store and are interested in wholesale purchasing. For purposes of EU data protection law, I, Diane Townsley, am the data controller of your personal information. If you have any questions or concerns, you may contact me at petaluna [!at] comcast.net or send me a convo through Etsy.